Is your Grange in need of a P.R. intervention? Public relations is a vital part of maintaining your Grange’s image. Good Public Relations practices communicate the Grange’s message both internally and externally - to the local community, its members, those with an interest in the organization, and the wider public in general. Public Relations opens the lines of communication between the Grange and the public and establishes a flow of information. A positive public perception of the Grange can increase its membership, increase awareness and visibility of the organization, and yes, ultimately improve its bottom line - an increasing membership. Internally, it will help build pride in membership that will grow a more successful Grange. From building awareness and credibility to supporting fund-raising efforts, well-executed public relations efforts can make the difference between achieving the Grange’s goals or falling desperately short of them. Can you answer “yes” to any of these statements? • My Grange has not put any effort into media initiatives (print media or social media) in the last 6 months. • Our Grange marketing ‘to-do’ list grows, but we never accomplish our goals. • Our members have not spoken to anyone outside of the Grange about our recent events and meetings. • Our members have not helped promote our activities and events from a personal level, such as talking about the Grange online or by hanging posters about our events around town. If you answered “yes” to any of these statements, then your Grange is in need of a Public Relations intervention. Favorable and consistent media exposure means recognition in the community, acknowledgement of Grange activities, services and accomplishments and a higher profile of your Grange among potential members. It is important for each Grange to find vehicles that create consistency. • Work with the Public Relations Committee to set-up a Facebook Page for your Grange -- and then be diligent about keeping the page current and up to date. • Take photos at all of your Grange meetings, activities and events. Send them to the Connecticut Granger newspaper and to the CT State Grange website -- and be sure to share them with your members as well. • Write brief announcements about your upcoming meetings and programs -- and send them out to the newspapers. • Issue Press Releases for Grange events, activities and projects -- and send them out to the newspapers. 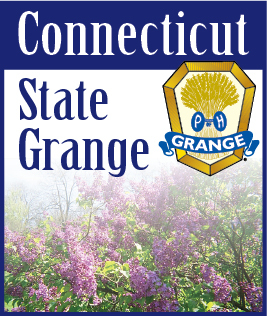 • Create a website for your Grange through the CT State Grange website program -- and then add information to grow your website. How we present ourselves and how we communicate is very important in the public’s perception of the Grange. Our audience forms and modifies their opinion of who we are every time they view something that carries our image or they have an experience with us. In their mind, the Grange either “has it together” or doesn’t. The success of the Grange depends on all of us communicating with consistency and effectiveness.